Denali National Park Tours, Custom Alaska tour and vacation packages for small groups, trips, whale watching, adventure travel, sea kayaking, rafting, bear viewing, Alaska Railroad Denali Star train, Denali Park, Seward Kenai Fjords National Park, Coastal Classic Train, Alaska cruises, and land tours.and Alaska. Custom group Alaska rafting adventures are available on request. If have interested in something special or participating in an exploratory expedition, please contact us with your ideas or to see what plans are being made. Don't just see Alaska, EXPERIENCE IT! Call or email to talk to a life-long Alaska expert. We are locally owned and look forward to answering all your Alaska travel questions and custom tailoring a special Alaska vacation or Alaska tour package for you. For over 27 years Backcountry Safaris has arranged custom Alaska vacations and guided Alaska travelers to some of the most exotic and remote destinations in Alaska. Our personalized custom pre- and post-cruise custom land tour packages offer you a better Alaska experience at a lower cost. Transportation options include the Alaska Railroad, and bus. Glamping is a combination of the two words, glamorous — camping. Combines camping with the luxury and amenities of a lodge or hotel. Stand-alone rooms with canvas walls and ceilings, wood floors and made-up beds, "no sleeping on the ground" and heated for warmth. Safari style luxury in the wilderness. Private wilderness fly-in bear viewing camp in Lake Clark National Park. Comfortable lodging in modern custom made WeatherPORTS fabric tension cabins. Our web page features only our most requested tours and Alaska destinations. If you don't see a tour that fits your schedule or desires, give us call or email. We specialize in custom Alaska adventure trips. If you can imagine it, we can make it happen. We offer personalized custom trips that cater to the special interests, dates, and desires of your group or family. Guided trips include comfortable lodging in our modern custom made WeatherPORTS fabric tension cabins. An all-inclusive Denali National Park tour package departing from Anchorage, Seward, or Whitter. includes bus to Denali, lodging at Denali, a narrated bus tour into the park, and a scenic ride on the Alaska Railroad back to Anchorage. Single Kayaks - paddle your own kayak. Most other outfitters use only two-person kayaks. Dry suits to keep you warm and dry. Our Bear Viewing and Giant Icebergs tour is a combination of our 3 day fly-in bear viewing trip in Lake Clark National Park and our 3 day Bear Glacier Wilderness Retreat sea kayaking adventure in Kenai Fjords National Park. Denali National Park and Kenai Fjords National Park tour package. Includes lodging in Denali Park and Seward, bus and Alaska Railroad transportation, bus tour into Denali Park, overnight lodging at Bear Glacier Wilderness Retreat, and sea kayaking around giant icebergs in Kenai Fjords National Park. Kongakut River - 10 day Arctic National Wildlife Refuge Rafting Safari. Explore Alaska's remote Arctic National Wildlife Refuge by raft on the "river of caribou". Our trip coincides with the annual migration of the 130,000-strong Porcupine caribou herd and passes through some of the world's most pristine wilderness. 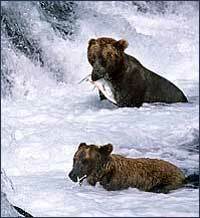 1 to 3 day bear viewing trips, private wilderness fly-in bear viewing camp in Lake Clark National Park. Ultimate bear viewing experience 7-days in Katmai National Park. Wilderness river trip on the Savonoski river. Seward flightseeing destination options that include Bear Glacier, Harding Icefield, Elsworth Glacier to just mention a few. Glacier landing options, glacier hiking, sea kayaking at Bear Glacier. Alaskan dog sledding experience. 1.5 hour tour that includes 15 minutes of flight seeing to Godwin Glacier and a dog sled ride. Tours are fully narrated by an accredited wildlife interpreter. 6 different day whale watching and glacier cruise options with a number of departure times. Bear Glacier water taxi transportation service to Bear Glacier and to Bear Glacier Wilderness Retreat for sea kayakers, campers, and hikers. Sit back, relax and enjoy the ride. A driver-guide will offer trip narrations and will point out points of interest along the way. Alaska highways offer scenic views, snow capped mountain peaks, glaciers, wildflowers, rivers, lakes and wildlife is often seen. Backcountry Safaris is a locally owned Alaska company. We have the professional staff, equipment, and experience to provide you with the Alaska adventure you've always dreamed of. As an Alaska Certified Expert travel agent we work with Alaska tour companies whom we believe offer a unique Alaska experience. We specialize in custom Alaska tour packages for independent travelers, small groups, families and custom corporate Alaska tours. Easy trip planning with just one phone call or email - Complete custom Alaska tour planning. We believe our specialized experience in Alaska travel can truly help make your Alaska visit the trip of a lifetime. Custom Alaska tour packages - Our custom tour packages allow you the freedom and flexibility to plan an itinerary and activities to fit your desires. Service - We've been helping visitors plan unique Alaska tours since 1986. Our 26 years of Alaska travel experience enable us to offer you a better Alaska adventure. Credibility - We are members in good standing with major adventure and travel trade associations. References are available on request. Call or email Backcountry Safaris today and talk to a life-long Alaska expert. We are locally owned and we look forward to answering all your Alaska travel questions and custom tailoring a special Alaska vacation or Alaska tour package for you.